While poking around my mom's [drool-worthy walk-in] pantry on a recent visit home, I spotted a torn-out magazine page peeking out between 2 cookbooks on a shelf. I felt like I was in some kind of slow-motion, magical movie scene where time stands still and I find the most perfect recipe ever. Maybe I'm exaggerating a little bit, but I grabbed the Cooking Light page with the lemon meringue tart recipe and tucked it in my Oregon-bound suitcase. With my mom's permission, of course; I could never do anything sneaky or subversive in her house. Or anywhere. Yeah. This tart wasn't quite as lemony as the lemon tart I made last year. Although the lemon was indeed more subtle, the unique crust and the light-as-air meringue made up for that missing tang, and the 3 layers played well together. 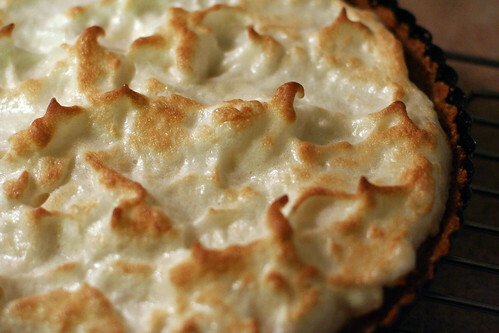 If you like lemon meringue, but don't want the heavy pie crust overload, you'll love this tart. I had the best time baking this tart with my friend Michelle in her newly renovated kitchen. Thanks, M! Can't wait to do it again. 2. Combine first 3 ingredients in a food processor; process until finely ground. With motor on, drizzle butter through food chute; process until blended. Press about crumbs into the bottom and up sides of a 9-inch tart pan coated with cooking spray. Bake for 10 minutes or until toasted. Cool. 4. Spread curd evenly onto crust. Place egg whites and salt in a large bowl; beat with a mixer at high speed until soft peaks form. Combine granulated sugar and 1/4 cup water in a saucepan; bring to a boil. Cook, without stirring, until a thermometer registers 250°. Pour hot syrup in a thin stream over egg whites, beating until stiff peaks form. Spread egg white mixture over tart. If desired, use your spatula to make small decorative peaks. Broil 30 seconds or until lightly browned. Simply beautifl! I can't wait to try it!